Lead-generation marketing is evolving rapidly, but many companies are still using the same methods they always have. How can a marketer know which lead generation tactics will provide them with the best, most actionable leads for their products or services? What’s been missing—until now—is a strategic look at how lead-generation tactics can work together to produce the maximum number of quality leads. 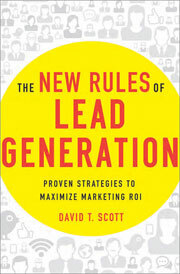 In The New Rules of Lead Generation, marketing expert David T. Scott examines the seven most successful tactics, including e-mail, direct mail, and search engine marketing; banner and social media advertising; cold calling; and trade shows. He reveals when to use which tactics, how to use them cost-effectively and get the best results, and how each tactic has changed in recent years and will continue to evolve in the future. Readers will also discover how to test new approaches on a limited budget and how to combine multiple tactics for a more powerful, integrated campaign. Featuring valuable tools for tracking costs and measuring results, this indispensable book shows marketers everywhere how to capture the leads they need to help their companies succeed.